Products ℅ E45, but all opinions are my own! If you're anything like me, your skin suffers in the winter time. I tend to get eczema patches on the tops of my arms and my hands can get really dry and sore (and there's no point painting your nails all pretty if you've got dry, cracked hands!). 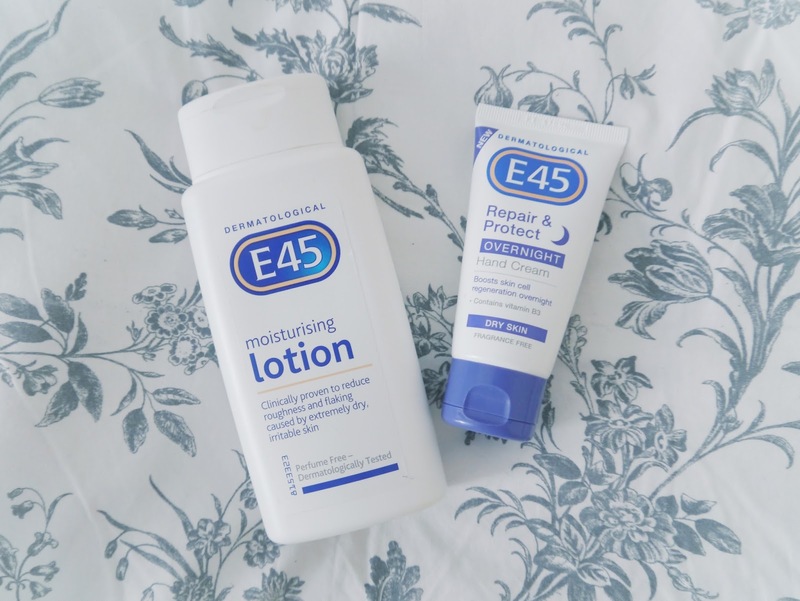 Noticing that I've blogged before about having seriously sensitive skin, the wonderful people at E45 contacted me and asked if I could review some of their 'winter saviour' skin care products for you all. As someone who often suffers from dry skin and struggles to find anything that will actually help, I was eager to try this out so I could let you all know whether or not these products are worth a try! The moisturising lotion is something I've been using everyday, I tend to put it on at night, letting it soak in for a few minutes before I put my pjs on. This is a really nice, light lotion that absorbs quickly - I've even put this on in the morning and I only have to wait a minute or two before I can get dressed. I can't stand moisturisers that leave you feeling sticky and gross for hours after applying them, so this is perfect for me. It's also unscented and hasn't irritated my sensitive skin at all. As a moisturiser, this is a really lovely product for keeping your skin soft and supple, but for extra dry patches I'd recommend something stronger…cue the overnight hand cream! Now I know this product specifies that it is meant to be used on your hands, and it is fab for that, but I've also been using it as a more intensive eczema treatment for my arms. I applied this product to the tops of my arms the other night when they got really red and sore, the next morning I woke up and all the redness was gone. There were still some dry patches but I think with regular use this product could really make a massive difference. Even my flat mate was surprised at how much better my skin looked after just one overnight application. As a hand cream, it soaks in quickly and is a really nice product to use. Instead of having my usual sore, red and scaly winter hands (sorry if that's TMI! ), my skin is now super soft and there's no sign of any dry patches on my hands at all. For more advice and products for eczema/dry skin treatment, you can visit the E45 website. What're your winter skin saviours? I'd love to hear some suggestions!